There’s a debate going on in education theory about “natural” learning versus what happens in formal education. It’s not likely to end any time soon, because it’s framed in the wrong terms. This article is about how the framing relates to a more widespread set of intertangled issues involving beliefs about nature and the natural. It’s a broad overview; I’ll deal with some of the issues separately in later articles. As is often the case, one key relevant phenomenon was first noticed a long time ago. The ancient Greeks were well aware of it; there’s a fair chance that earlier civilisations had also spotted it. As is also often the case, the ancient Greeks proceeded to invent an explanation for the phenomenon which was very plausible, and which was also not just wrong, but actually worse than wrong, because it lured everyone off in the wrong direction for the next couple of thousand years. The phenomenon is that there are often two different ways of tackling a given problem. Some people will tackle the problem “intuitively” – they are unable to express their methods in words, and they often refer to visual or other sensory issues in relation to their solution. This is arguably related to how children learn before they start formal education. Other people will tackle the same problem “logically” – a key feature of their approach is that they use explicit, systematised notations and processes, very much like the methods that are used to instruct children in school. The ancient Greeks also spotted something that has been widely agreed ever since. The first approach is common among artists and in the humanities; the second is common in engineering and the sciences. Again, so far, so good. After this, though, things quickly began to go subtly but deeply wrong. The ancient Greeks had two words for it. The “intuitive” approach became known as the Dionysian, after the god of revelry and fun. The “logical” approach became known as the Apollonian, after the god who handled reason. The Dionysian approach was associated with intuition, the senses, freedom, lack of restraint, the wild, and the natural. The Apollonian approach was associated with logic, the intellect, control, restraint, the rule-based and the artificial. It’s a distinction that’s been in use ever since, under various names. It crops up in education, in the debate about “natural” learning versus “school” learning. One interesting implication is that because “school” learning is being set in opposition to “natural” learning, “school” learning is therefore in some way “artificial” at best, and at worst unnatural. I’ll leave aside for now the idea that “It happens in nature so therefore it’s morally right”. I’ll remain instead with the time-hallowed concepts of natural/intuitive versus artificial/logical. When the same concept has been in use since ancient Greek times, it’s usually for one of two reasons. 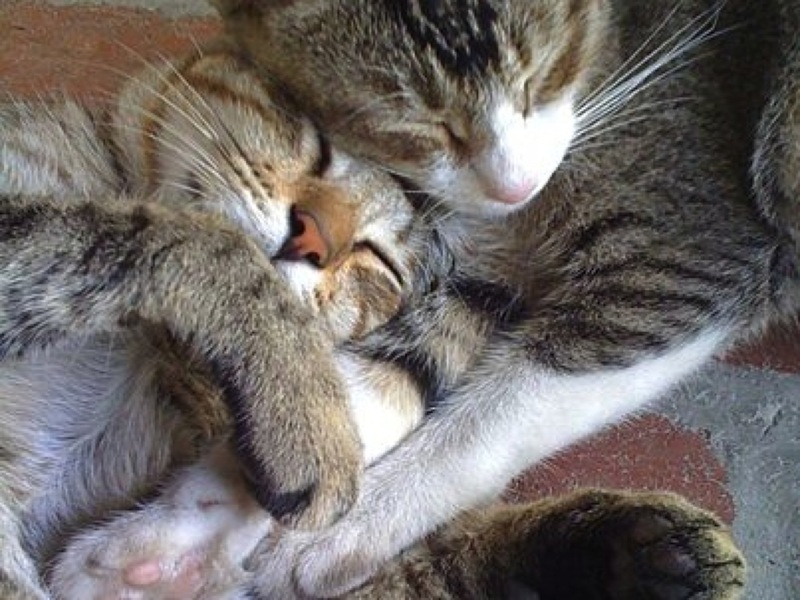 One possible reason is that the ancient Greeks got it pretty much right. That’s what happened with Euclid’s work on geometry, which is still in use today. The second common reason is that the ancient Greeks got it partially right, and then went off into wibble space with some plausible-looking but misleading idea that people have been arguing about fruitlessly ever since. So how does the distinction between “the intuitive/natural” and “the logical/artificial” stand up to that test? It’s a very plausible distinction, and it can easily be mapped onto everyday experience, but that doesn’t actually prove very much. Just because something has high descriptive power, that doesn’t mean that it’s true or useful. An everyday example of the problems with descriptive power involves a pair of proverbs. Anything that goes wrong can be accounted for by one or other of those two proverbs. Between them, they can describe every mishap. They have high descriptive power. However, in terms of predictive power, and analytic power, they are completely useless. They give no guidelines on how to assess a particular case in advance, so you can decide whether the right strategy is to spend more time looking before leaping or to move quickly before the opportunity is lost. They can only be applied in hindsight, at which point they give the impression of wisdom, but are utterly useless in practical terms. The distinction between “intuitive” and “logical” doesn’t stand up well to this test. Intuition in particular is usually treated as a black box, and viewed as something quasi-mystical that can’t be explained in words. This isn’t very helpful. In a later article, I’ll look at a more productive way of analysing this distinction, in terms of parallel processing versus serial processing. Here, though, I’ll look at the wider context of our view of “natural”. Attitudes towards nature and the “natural” have changed very significantly in Europe across the centuries, and are often very different across cultures. A classic examination of this topic is Man and the Natural World: Changing Attitudes in England 1500-1800, by Keith Thomas. The image below shows a pair of scenes that illustrate a common modern view of the “natural” world in opposition to the “artificial” world. On the left, we see a beautiful soft landscape, with sunlight falling on the contented peasants and on distant classical ruins. On the right, we see a model of the Parthenon, where every line has been carefully designed to show an aesthetic principle in the mathematics of its proportions. It’s clean and pure, and also impersonal, and on the edge of boring in its stylised perfection. Nature and the artificial, however, haven’t always been viewed in this way. The current western view of nature as something good and pure is quite a recent development, in historical terms. For much of history, nature has been viewed as threatening and wasteful. Nature tends to be viewed as benevolent by societies that feel in control of it, and that can afford to be nostalgic. It’s no accident that the Romantic movement, which celebrated nature, began in the same era as the Industrial Revolution. This issue has recently started to re-surface in response to suggestions that Europe should be substantially re-wilded – in other words, that we should re-introduce as many species as possible to their pre-modern range. That idea started off well, but soon ran into serious opposition. Here are two reasons for the opposition. Even though wolves and bears live wild in several European countries, there’s substantial opposition to the idea of re-introducing them to countries where they have gone extinct in historical times, such as Britain. A very common reason is fear: fear that these animals would kill people. The statistics of human deaths from wolf attacks and bear attacks don’t have much effect on this fear; it’s visceral, not statistical. Nature, in this context, is no longer a cosy view of idyllic landscapes; instead, it’s much closer to the old concept of nature as something untamed that might maim or kill you. 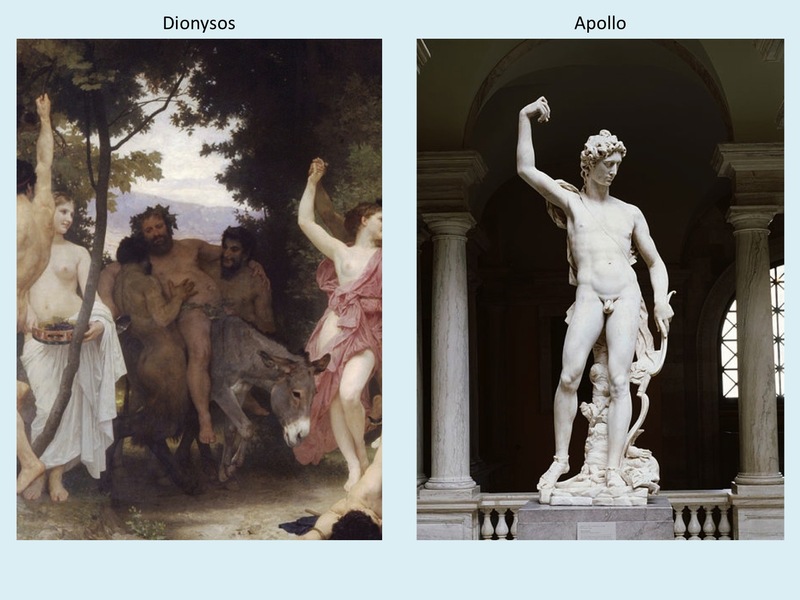 When you look at ancient Greek images of Dionysos and Apollo, as opposed to the modern-era images at the start of this article, you realise that the ancient Greek world view was very different from our modern view of the same concept. 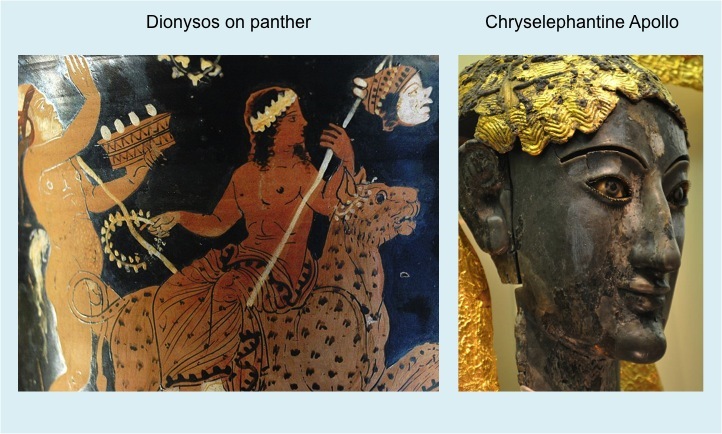 In the image above, Dionysos is very different from his companion Silenus, the kindly old man on a donkey in the first image in this article. Instead, Dionysos is shown riding on a panther, hinting at the savagery of the wild revels with which his worshippers were associated. Apollo isn’t an austere white marble statue; instead, he is represented in gold and in ivory, with facial proportions very different from the usual stylised busts that we see in museums, and in colours very different from our usual stereotype of white marble. The relationship between the two deities was complex, and was not a simple pair of mirror-image opposites. It was a very different world back then from what we usually imagine. One theme that emerges is the widespread assumption that natural implies good, and that one of its opposites, artificial, has undertones of unnatural. This assumption is widespread, but that doesn’t make it true. When we look at concepts of nature across time, we see that this view of nature as good is usually a product of societies where nature is perceived as having been tamed. The issues above crop up in a wide variety of debates and in various forms. The debate about “natural” learning and “artificial” learning is one example, to which I’ll return in a later article. Another issue is the belief that intuition is natural and that therefore it is better than “artificial” approaches such as using science, evidence and systematic reasoning. This has big implications for public policy debate. I’ll be looking at the use of evidence within different rhetorical styles in another later article. This entry was posted in aesthetics, education theory and tagged concepts of nature, formal instruction, natural learning by hydeandrugg. Bookmark the permalink. Now, I am thinking about how theories like Cognitive Apprenticeship and Communities of Practice are influenced by the natural and logical concepts of learning. Thanks, I was hoping for an evening void of interesting questions!